Electricians install and maintain electrical systems in homes, businesses and factories and play an integral role in the economy. Almost every building or house has an electrical system that is installed during construction and maintained after that. Electricians held approximately 2,780 jobs in 2011 throughout Idaho, of which 57 percent were employed in the electrical contractors and other wiring installation contractors industry, but more than 5 percent of manufacturing jobs in Idaho are filled by electricians. 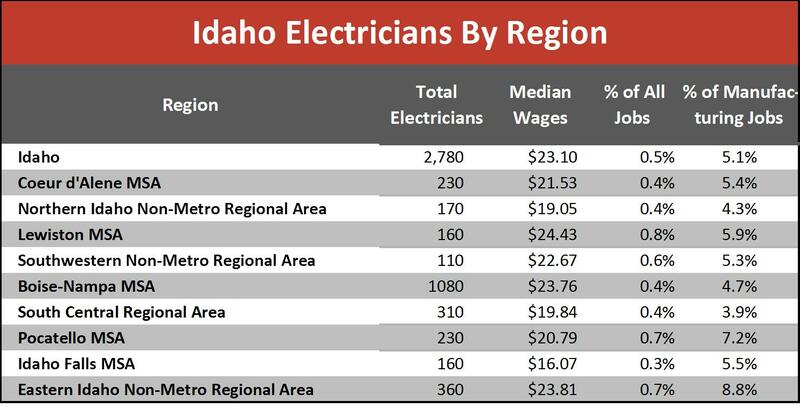 The median hourly wage of electricians is $23.10 in Idaho. The starting pay for apprentices usually is between 30 percent and 50 percent of what fully trained electricians make and receive pay increases as they gain more skill. 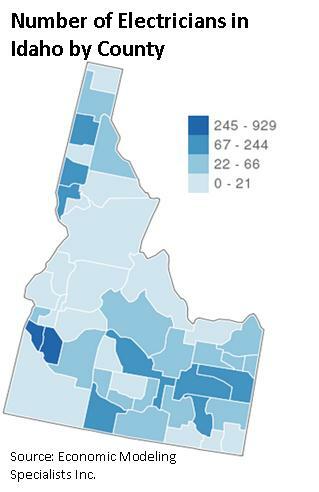 According to Economic Modeling Specialists Inc., 48 percent of electricians in Idaho earned a postsecondary certificate, 15 percent have a two-year degree and 29 percent hold a high school diploma. Employment of electricians fluctuates with the overall economy. Residential electricians were hit hard through the recession and have been forced to re-evaluate their skills. Many have transferred their skills to manufacturing or some other sector completely. Electricians in factories tend to have the most stable employment. As manufacturing continues its pace throughout this recovery, the need for electricians will continue at a similar rate. According to Idaho Division of Building Safety, there were 5,365 active journeyman licenses on Feb. 1. There were another 644 master electricians, which is a step above a journeyman, and 3,037 apprentice electricians. There were 3,185 electrical contractors registered with the state including those classified as specialty contractors. State records also show 56 industrial accounts with electrical contractor’s licenses including manufacturing, utility, mining and miscellaneous private companies. Forty-six industrial accounts were issued to public schools and major hospitals. Idaho Department of Labor’s Short-Term Occupation Projections show that by 2014 the statewide need for electrical workers will rise to approximately 3,178, nearly 400 more electricians than the state currently employs. Almost 12 percent of the estimated short-term annual openings are due to replacements resulting from workers retiring or permanently leaving an occupation. In the long term, that number is projected to grow to 70 percent as more electrical workers start to retire in line with the general population. But total growth is expected to be lower. The annual split over the next 10 years is 36 new jobs and 84 replacements. This entry was posted in Job Seekers and tagged electricians, idaho department of labor, idaho employers, idaho jobs on March 1, 2013 by Idaho Department of Labor.